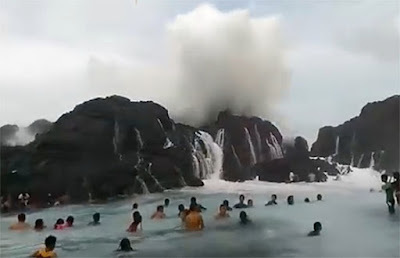 The Laswitan Falls and Lagoon is actually a unique 20-foot rock formation located near the shore in Cortes. This geological feature creates three natural basins so that when the surf becomes high, the huge waves would flow and spill into the main basin on the other side, thus creating a waterfall effect. The lagoon below the rock formation is so huge in that it can fit up to 200 people – maybe even more! Tourists visiting the place can dip in these pools and get themselves splashed by the sea water coming from the other side. The lagoon has a deep part which swimmers can enjoy but there is also a shallow area that other people can dip in.